This Sunday, May 15 on Mont Lachat Thônes. A beautiful hike alternating steps in forest, grassland and limestone pavement. At the top, a 360 degree panorama facing the Aravis and Mont Blanc. 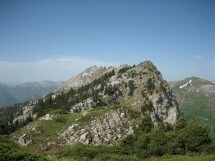 From Villards (55 km from Geneva), we walk on a panoramic summit. A circular hike.